The Thermaltake Massive23 LX Laptop Notebook Cooler supports 10" to 17" laptops. 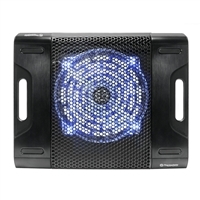 The Massive23 LX uses black metal mesh which further helps to cool your laptop. Anti-slip rubber help to keep everything in place during use. A large 230mm blue LED fan adds cool sytle and can be toggled via the On/Off control switch. 2 USB ports are also available so you don't run out of USB ports. The Massive23 LX is the perfect cooler for extended gaming or work sessions.